Like a college student trying to smarten up and shake off a party-boy reputation, Vang Vieng is evolving to attract a different sort of tourist. 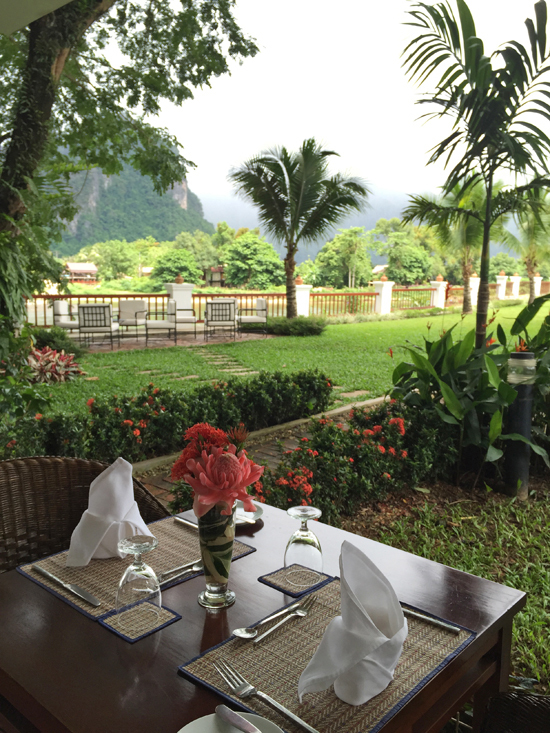 Opened in 2012, Riverside Boutique Resort is Vang Vieng’s first luxury boutique hotel and it has rolled out the welcome mat for upscale travellers to discover the region. Finally, the town boasts a hotel befitting of its spectacular scenery. Ad Book now! Rates from US$126++. Average rating 8.8 from 927 reviews. 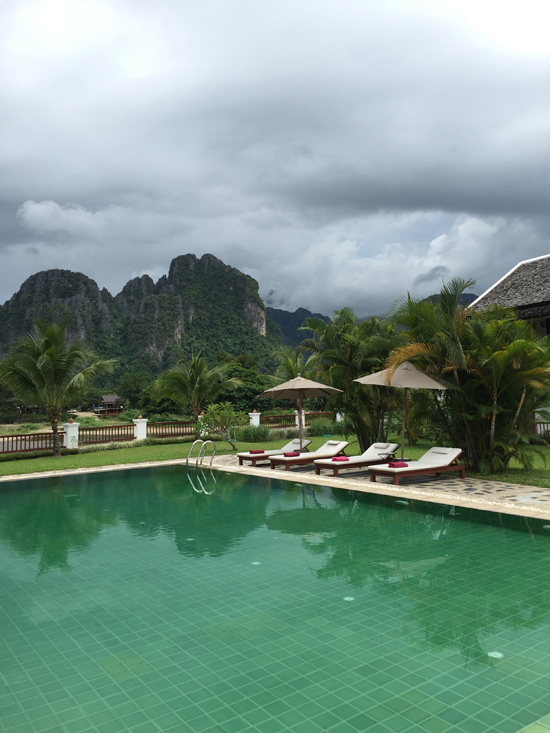 The hotel’s 32 rooms and two suites are tasteful, elegant, intimate and refined – all these words the antithesis to how you would describe Vang Vieng just a few years ago. Sunlight filters through gauzy curtains and illuminates the stark white walls decorated with framed prints. Rich wood bed frames, natural materials, rattan furniture, a vase of fresh tropical flowers and polished terracotta floors warm the space up. 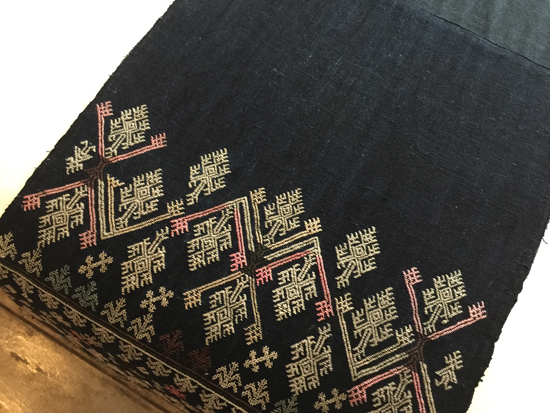 The decor of each room is based on one of the country’s ethnic minority groups and it vividly showcases the tradition and diversity with bold accents, from naturally dyed indigo Tai Lue throw pillows, to finely hand-embroidered Yao bed runners to gleaming silver beaded Akha headdresses on the table. It’s in the finer details. 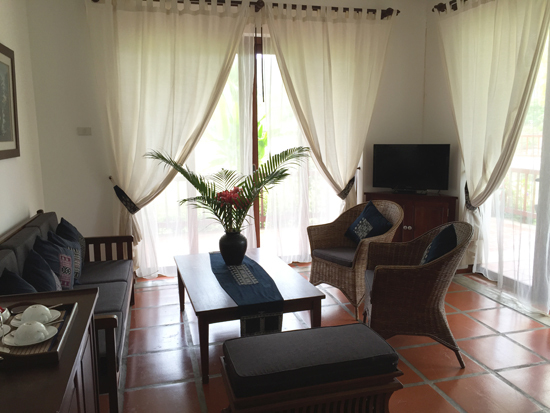 All rooms come with a private balcony, minibar, tea and coffee, WiFi, flatscreen TV and safety box, as well as those little extras that only a few years ago would be unheard of in Vang Vieng: hair dryer, bathrobes, king size beds. The monochrome bathrooms are sleek, modern and spacious, with shower/bathtub combo. The suites, of course, are the best with breezy living room, glass doors on all sides and a wraparound terrace. Rooms face the central swimming pool and garden, a prime spot for taking in the dramatic landscape. The restaurant/bar is, like the rest of the property, a beautiful space and if you’re tired of the mediocre meals in town or the loud music that often accompanies it, treat yourself here. The menu features both Lao and Western dishes, mains range from 55,000 to 120,000 kip, while a glass of wine to go with your meal is 42,000 kip. Throw in a sundowner at a riverside table and you have a whole evening away from the tacky town. “Boutique” is a word that gets added liberally to hotels in Southeast Asia. But what it comes down to is the detail and this is where Riverside delivers, right down to the Yao embroidered cuffs on staff uniforms, the manicured yet lush tropical gardens and what’s in the gift shop: think interesting tribal handicrafts, textiles woven in Laos for sale, plus cultural books and Lao silver jewellery. 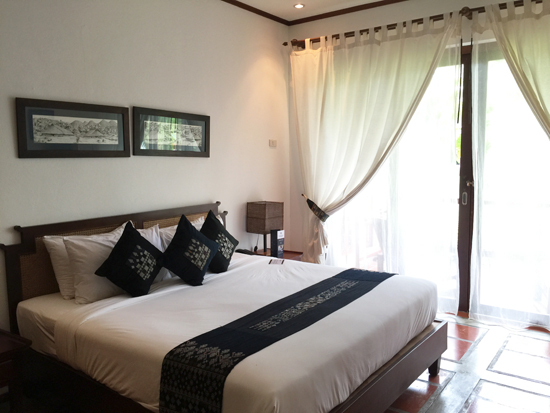 The hotel can arrange excursions, tours and picnic lunches, as well as private transfers from Luang Prabang or Vientiane. They also have bicycle rental and tuk tuk shuttle. Check rates at Riverside Boutique Resort on Booking.com.